Jomama Jones is back! Having fled to Switzerland in the 1980s after her record company demanded that she water down her material and "relax" her magnificent Afro, the '70s pop phenomenon has returned to these shores to promote her new CD, "Radiate," and encourage us to remember where we came from, where we're going, and who we are: stars in our own right! At least, that's the premise of "Jomama Jones: Radiate," the entertaining concert musical currently running at Soho Rep. As embodied by her creator, Daniel Alexander Jones (who is listed in the program as Jomama's cousin), Jomama is a tall, sultry-voiced diva who is one part camp goddess and one part motivational speaker. Supported by two singers, the Sweet Peaches, and a five-piece band led by the show's composer, Bobby Halvorson, Jomama tells us her life story in between performing songs from "Radiate," flirting with audience members, and inviting everyone to join her in a communal dance at the end of the evening. What makes "Jomama Jones" theater and not merely a souped-up cabaret or drag show devoid of drama, conflict, or plot is Daniel Alexander Jones' heartfelt performance. He transforms a potential cliché into as offbeat and delicious a character as I've encountered in quite a while, and it's both refreshing and energizing to bask in the unique personality he conjures. The songs, by Jones and Halvorson, with additional contributions from Sharon Bridgforth, Grisha Coleman, and Amy Hunt, are much closer to popular music than theater music. Nevertheless, their quirky lyrics manage to further delineate Jomama's one-of-a-kind personality. And the music, with its echoes of soul, funk, Elvis Costello, and Coldplay, is simply fun to listen and move to. Though most of director Kym Moore's staging is of the stand-and-deliver variety, she never permits the onstage action to flag, and she finds just the right balance between silly poses and heartfelt moments. 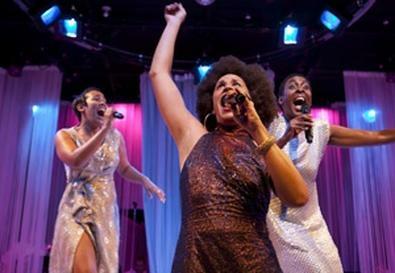 In addition to providing outstanding vocal support, Sonya Perryman and Helga Davis present the Sweet Peaches as people who look like us, rather than Supremes clones. Jing Xu, a pixieish woman in a sci-fi costume, assists Jomama in her interactions with the audience and functions as a visual brake when the musical begins sliding toward parody. Arnulfo Maldonato's striking set, a round white platform bounded by sheer curtains, provides the perfect backdrop to the wonderful costumes designed by Oana Botez-Ban and Ron Cesario. While it's true that the lack of a dramatic motor causes "Jomama Jones: Radiate" to stall from time to time, and although its roots as a concert are always on view, for most of its 70-minute length it's a rewarding visit with a true theatrical original. If theater is character, this is fresh stuff. Presented by and at Soho Rep, 46 Walker St., NYC. Jan. 4–15. Thu.–Sat., 7:30 p.m. (212) 352-3101, (866) 811-4111, www.theatermania.com, or www.sohorep.org.